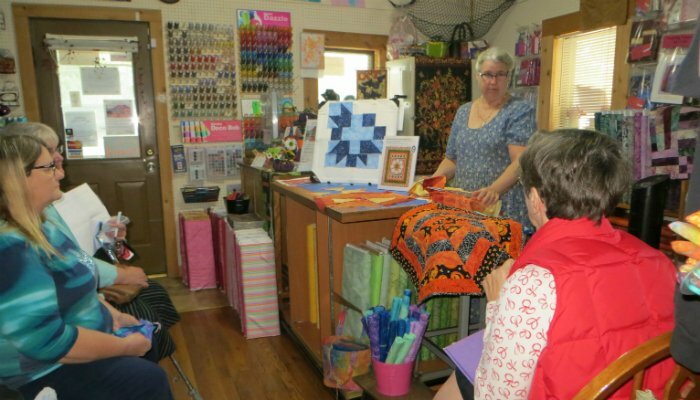 We are a full-service quilt shop located in the “country” artisan community of Kechi, Kansas. Kechi is a suburb located on the Northeastern edge of Wichita. The shop is easy to access, located on 61st Street and nestled between interstates 135 and 254. The shop sits 2 houses east of N. Oliver on 61st St. next to the Historic Kechi Playhouse. The famed shop, Karg Art Glass, is located on the nearby corner. Our shop is in a cute house with all the comforts of home. The front of the building showcases painted quilt blocks. When the shop is open look for the Quilts hanging out on the porch & the Quilted Car Cover out in front of our shop. Our shop is full to the brim with premium quality 100% cotton quilting fabrics such as those by Maywood, Island Batiks, Hoffman, QT, Northcott, Timeless Treasures, Exclusively for Quilters, Troy, Timeless Treasures, Batik Textiles, Blank, P&B, RJR, and Quilt Gate. Our shop has been located in Kechi for over 9 years. It has grown from our first goal of having 300 bolts of fabric in 2007 to a very full and fun shop of over 3,000 bolts of fabric, notions, kits, clubs, and fat- quarters galore. Not to mention our wonderful customers. Our MISSION is to help others learn to quilt and sew better, as well as to help spread the love of quilting! 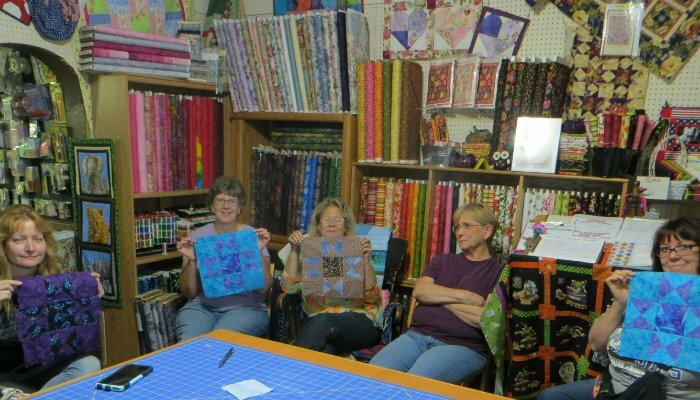 Today, Stephanie, Rachel, and Karen are the owners of Kechi Quilt Impressions. Stephanie, together with her youngest daughter Rachel, started this business in 2007 while Stephanie was still teaching school. Stephanie had sewn all of her clothes in high school, always wanting to quilt, but no one in her family knew how. She has degrees in Home Economics, Computer Sciences, and copious hours in Art. She also has a Master’s Degree in Education. Finally in 1979, when her son was born, she got the chance to take a beginning quilting class. We shall say the rest of the story is history, because the quilting bug bit her! Stephanie owned a quilt design company “Quilt Markings” before opening the shop and today Kechi Quilt Impressions is the exclusive provider for Quilt Makings - Wholecloth & Trapunto quilting products. Rachel, still very busy seeking her degrees and career in the medical fields and Chemistry, makes sure the fabric in the store contains lots of vibrant, bright colors “suited for the younger quilters” and of course herself. She got her start in quilting as a small child sorting and playing with fat quarters and fabric scraps, as well as reading quilt books. From her early days she began making outfits and costumes and participated in quilt challenges. To this day she is an avid quilter, hand quilter, and seamstress. The car cover shown in the picture was made as part of Rachel's Girl Scout Gold Award Project, Miracle Blocks, to help raise awareness for the Children's Organ Transplant Assoc (COTA). All quilt blocks in the car cover were made by quilters from multiple quilt guilds all around Kansas. Karen is our newest partner. She is a hospice nurse and a quilting extraordinaire! Her love and knowledge of sewing and quilting has been a fresh inspiration for everyone here at the shop. She has won many awards for her beautiful quilts. She delights in making great samples and kits to highlight our beautiful fabrics. We hope our new website will allow us to provide more access to our quality, ready to sew Kits and Block of the Month programs with easy to use often pictured, instructions as well as our fine materials and supplies.